Large single, soft golden yellow-orange flowers with prominent deep amber stamens. Repeat flowering. Strongly scented. Dark green foliage and reddish young stems. 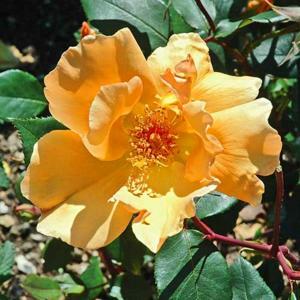 Fertile, moist, well drained soil in sun or part shade. Suitable for growing in a large container.